Cody Crocker will line up for the final round of Australia's fastest growing and most spectacular stadium style off-road sport, the SXS Australian Championship this month. With a narrow 24-point lead over second placed Nathan Weissel and just another 7 points back to third placed Brett Comiskey and up to 42 points available for a perfect round, the game is far from over. Cody Crocker is a well-respected name in local and international rally circles. He has won three Australian Rally Championship titles, four Asia-Pacific Rally Championship titles and he is four times winner of the Australian SXS Challenge in a Polaris as part of the ARC. A long time Polaris campaigner, Crocker has made a successful transition from Rally into off-road winning the final of the Superlites B category of the Australian Off-road Championship in Waikerie earlier this year and he is currently leading the SXS Australian Championship in his Polaris XP Turbo pitted against SXS competitors of all makes including CanAm and Yamaha. Despite a challenging start to the season related to bedding in the new car and adapting to a new environment, Crocker has clawed his way into the championship lead but must still finish strongly to take home the silverware. "Rally is very different. It's all about precision and finesse on relatively smooth dirt roads", said Crocker. "Off-road is more complex as we have to compromise corner speed for longer travel in the suspension and the distances are much longer between service stages so endurance is another factor to blend in. The stadium events however are literally 10 minute sprints and it is wheel to wheel with other drivers rather than against the clock. It's very exciting". 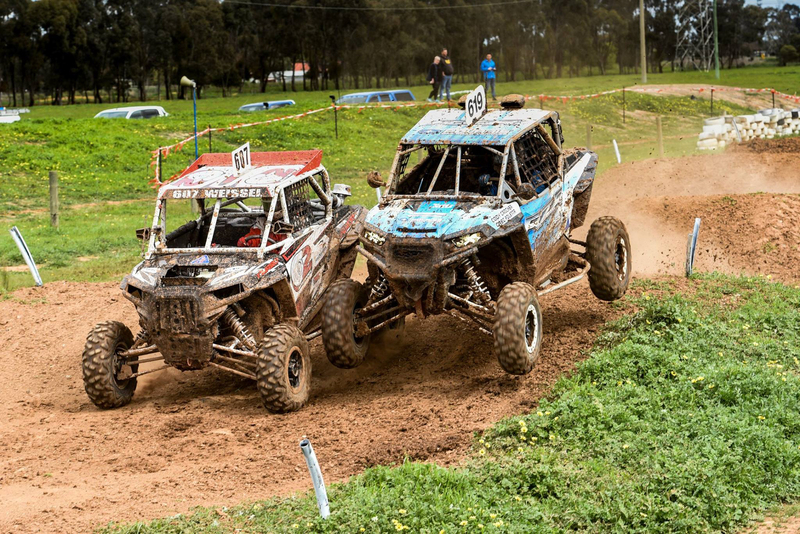 The Polaris RZR Australian Championship commenced in 2015 as a one make, one model category conducted on demanding motocross circuits across NSW and Victoria with hard braking, fast sweepers and big jumps. In 2016 it expanded to an additional category, the SXS Australian Championship, opening up for the inclusion of the new Turbo Polaris RZR and other brands. The series has continued to grow and attract the interest of many top drivers in addition to Crocker including four times ARC Champion Simon Evans, his brother three times ARC Champion Eli Evans, Rally driver Molly Taylor and many series regulars. It's a purpose built off-road recreational vehicle. Here are some of the standout specifications and features. Rear: Trailing Arm with Stabilizer Bar, 3.0" FOX Podium Internal Bypass Shocks (comp adjust/remote res. ), 18" (45.7 cm) Travel. Front: Dual A-Arm with Stabilizer Bar, 2.5" FOX Podium Internal Bypass Shocks (comp adjust/res. ), 16" (40.6 cm) Travel. Disc brakes on all corners on 14" alloy wheels, Triple piston front, dual piston rear. Polaris Prostar 925cc 4-Stroke DOHC Twin Cylinder Turbocharged producing 144HP. Transmission is automatic clutch with PVT and High/Low/Reverse options. Drive system is High Performance True On-Demand AWD/2WD. Minimum requirements for CAMS approval includes the replacement (bolt-on) of the ROPS with a cage built to CAMS specifications. Rally seats and 5 point harnesses. No other modifications are undertaken. The engine, ecu, exhaust, transmission, suspension components and geometry remain stock / unmodified. Polaris Industries Inc. (NYSE: PII) is a global powersports leader with annual 2015 sales of $4.7 billion. Polaris fuels the passion of riders, workers and outdoor enthusiasts with our RANGER®, RZR® and POLARIS GENERAL™ side-by-side off-road vehicles; our SPORTSMAN® and POLARIS ACE® all-terrain off-road vehicles; VICTORY® and INDIAN MOTORCYCLE® midsize and heavyweight motorcycles; SLINGSHOT® moto-roadsters; and Polaris RMK®, INDY®, SWITCHBACK® and RUSH® snowmobiles. Polaris enhances the riding experience with parts, garments and accessories sold under multiple recognizable brands, and has a growing presence in adjacent markets globally with products including military and commercial off-road vehicles, quadricycles, and electric vehicles. Information about the complete line of Polaris products, apparel and vehicle accessories are available from authorized Polaris dealers. Crocker (619) and Weissel (607) get cosy in turn one at Shepprton.